Sorry for the delay, but I have an interview that’s over an hour this time on image processing. In past episodes, I have talked about how you can’t get any more information out of an image than what is in a single pixel. Dr. Tod Lauer is an astronomer who has worked on all kinds of telscopes and instrument data and has developed numerous image processing techniques over his career. In this episode, we discuss some of those and how to correctly – versus incorrectly – apply them to image data to get to the best representation of the original object, or what the image was trying to capture. There are no additional segments in this episode, but the interview runs nearly 1hr 15min. This is also the episode for the second half of February. I’m very much hoping/trying to get the first half of March’s episode out before I leave on a trip on March 19. It will either be an interview on what’s a planet, or a normal episode on Apollo Hoax miscellaneous claims I never did an episode about. I’ll be attending a µSymposium before the Lunar and Planetary Science Conference this coming weekend, and I just got a reminder e-mail today. Included in that e-mail was a link to an animation that shows Shackleton crater, a crater that is ON the moon’s north pole. As such, its interior is in permanent shadow. BUT!! The Lunar Orbiter Laser Altimeter instrument (LOLA) on the Lunar Reconnaissance Orbiter (LRO) has plenty of data that allow it to be viewed: Click Me!. I find this very neat — until the last decade, we could never see stuff in permanent shadow because we didn’t have the instrumentation. LOLA and LROC have allowed us to do that. And there are thousands of craters in permanent shadow on the moon that may hide water (which is what I’ll be presenting at the µSymposium). For reference, the north pole of the moon is just about smack dab at the 10:30 position on the large crater’s rim. Just inside the rim, along a line from that small crater just outside the rim to the center of the crater. But for pseudoscience, you may also notice that there are some artifacts in the data. There are radial streaks from the center of the frame (usually). There’s a prominent one diagonally from upper right to lower left on the upper wall of Shackleton itself. Others are more prominent towards the edges of the animation. These are not lunar roads nor subways nor trollies nor anything else made by an ancient civilization. They are artifacts in the data itself. LOLA is very well calibrated, and the “average” (root-mean-square) uncertainty is under 5 meters in elevation data. But some tracks (orbits) are a bit off. And since LOLA is fundamentally measuring the time it takes light to bounce off the surface from a laser beam from the craft, it needs to know exactly where the craft was to get an accurate surface elevation. And some are off by a bit. These manifest in this kind of product as ridges or troughs that are perfectly in a straight line, along the line of the orbital track. It’s something that scientists who use these data see and ignore because we know exactly what they are. But pseudoscientists will look at line artifacts like this, or at image seems in a mosaic, and claim things like they are artificial tram lines. I subscribe to Expat’s “Dork Mission” blog in my RSS reader, and so I’m privy to people other than Richard Hoagland that he has made an hobby of watching and looking for perversions of rationality. One such set of claims is by a self-titled “civilian intelligence analyst,” Robert Morningstar. Robert Morningstar (or M* as he occasionally signs things and I’ll use for short) was on Richard Hoagland’s radio program on September 3, and on the program he discussed many things, but there was one in particular that I’d seen Expat discuss before, but I’d never really investigated myself. The claim is so bizarre that I wanted to share it with you. 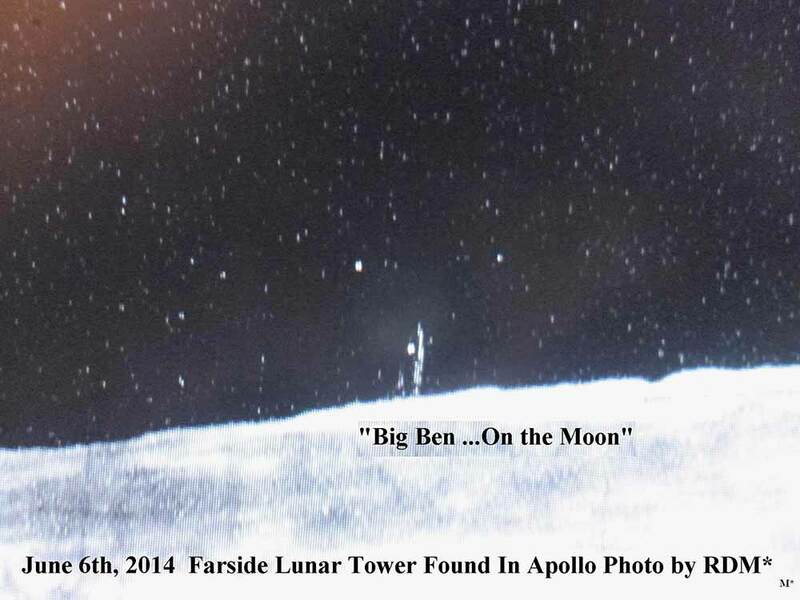 Robert has made this claim for at least a year, that he has found what he terms “Big Ben” (named for the famous London landmark), but on the Moon. He found this while analyzing lunar photographs. The object is 10 miles high, according to his analysis. It was only when I heard how he did his analysis and I looked at the photos he presents, myself, that I decided this blog post was worth it. First off, it’s difficult to know what photographs he used in terms of catalog numbers. Robert, like many in his field of anomaly hunting, does not provide documentation to allow independent analysis, rather he only presents the image in and of itself. This also means I can’t go find other versions of it that might be earlier generations, nor can I find the highest quality nor resolution. Based on the fiducials (crosshairs) faintly visible in the photograph, I think this was Apollo. From searching through Expat’s blog, I found I was correct, it’s Apollo image AS17-M-2366. Let that heading sink in a moment. What Robert did, as he stated on-air, and is evident from the obvious slightly rotated-from-vertical pixels in the second image, is he took the first photo (likely higher resolution than I have, but again I don’t know what the photo is so I can’t look), he likely enlarged it on his computer screen (if he didn’t, that doesn’t matter for this analysis), and he then took a digital camera and took a photograph of his computer screen. It’s from that photograph of his computer screen that he then did any and all subsequent analysis. This is one of those cases where I’m literally at a loss for words. It’s almost a situation of Not Even Wrong. To put it as succinctly and briefly as I can, he has introduced a substantial amount of completely unnecessary artifacts into the image that the idea that he thinks this is a proper way to analyze an image makes me question every single other claim he might ever make in the future. Put another way, he has somewhat close-ish to original “pixels” in the original image (again, this is a somewhat early scan of an early copy of an Apollo photograph). Why would you then go and take a picture of your computer screen and analyze that picture?! And, in classic pseudoscientific fashion, M* does not look for other scans of the same photograph and show us that the feature is still there, nor does he present us with any images from a half dozen other spacecraft that have photographed the entire moon since Apollo and shown us that the feature is still present. 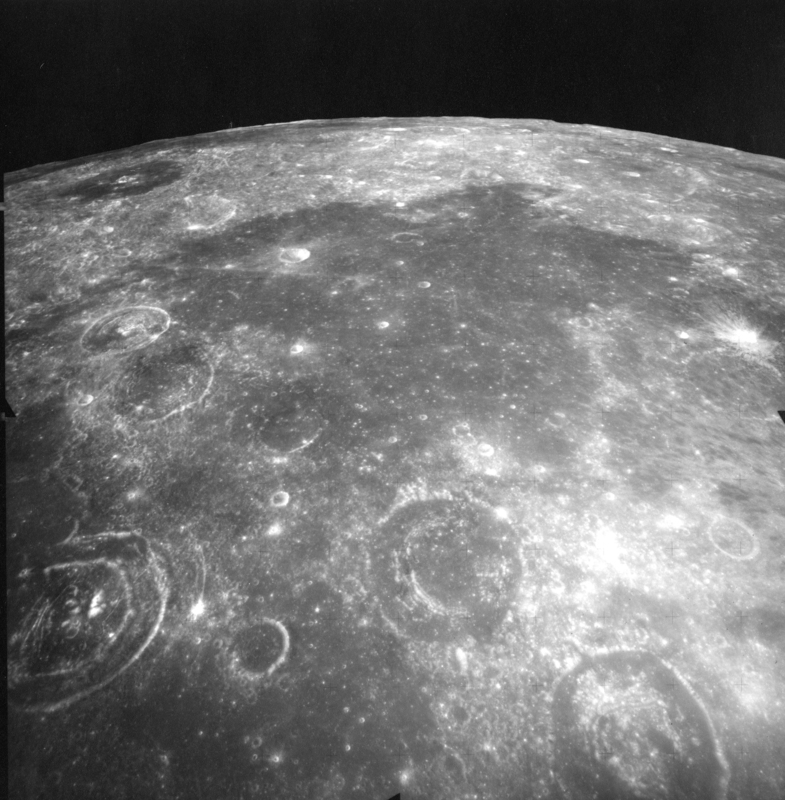 In fact, towards the former point, Arizona State University is in the process of scanning all the Apollo photographs at much higher resolution than had been done years ago by the Lunar & Planetary Institute (LPI). Here’s the link to AS17-M-2366 where you can download a 1.2 GB version of the image, or you can browse a 660 KB or 11 MB version. You’ll note that, if you take a look, those pieces of lint are gone. Now I suspect that if confronted by this, Robert would just say that it’s been removed by The Powers that Be to hide it and give fodder to debunkers like me. Here’s the problem: If your only evidence is one version of one photograph, and no other version of that photograph, the next photograph in the series that shows almost the exact same area, nor any other photograph of that area shows the feature, chances are your first photograph is the one that’s wrong, not every other one. Extraordinary claims require extraordinary evidence, and a feature that looks like lint, only found in one version of one photograph, that looks like lint in other areas of the photograph, and compounded with “analysis” of that feature on a photograph of that image being displayed on a computer screen, does not extraordinary evidence make. Part 2 of the Great Pluto / New Horizons Conspiracies podcast mini-series is now posted. This one is loosely tied together through the theme of anomaly hunting, and it has a special guest star of (faulty) image analysis. To be fair, again, all of these I have written about in my 11-part series. However, I know some people never read blogs and only listen to podcasts, and vice versa. So, I’m double-dipping. I don’t care. Again. And it’s late at night … again … so I’ll close this brief post out by saying that I was recently interviewed not only on Steve Warner’s “Dark City” podcast, which you can directly listen to at this link, but I was also on Episode 363 of “The Reality Check” podcast to discuss New Horizons — and there really is only a smidgen of overlap between that TRC episode and my podcast episodes on the subject. So don’t not listen because you think that you’ll be hearing the same thing. This is the last planned post in this series of posts of pseudoscience related to the New Horizons Pluto flyby, until at least we get more images in a few weeks. This is also hopefully the last post that uses Richard Hoagland’s statements as an example of a style of claims made about New Horizons -related pseudoscience, at least for awhile. This particular one is NOT unique to claims that Mr. Hoagland has made about New Horizons and what the images show about the surface of Pluto and Charon; rather, he has made this particular claim about practically every solid body in the solar system: Geometry = artificial. Let’s start looking at this claim as Richard makes it, for on its surface, it seems like it might make sense. Richard, whenever bringing this up, does not claim credit for it. Rather, he says that this comes from Carl Sagan (argument from authority), that when some of the first satellite photos of Earth were returned, Carl searched for any signs of intelligent life, and the only thing he could find was a dark logging road in Canada in contrast against white snow. That it was long and linear. Hence came the maxim: Intelligence will reveal itself on a planetary surface by creating geometry. I have paraphrased it slightly, but unfortunately I don’t have the audio in front of me so I can’t state it exactly. But really, that’s the claim: If you see regular, repeating geometry, it requires life. Now again, on its surface, this makes sense. People certainly make geometric patterns (it’s easier to drive on a straight road, for example, and we like to make square or angular buildings). We see nice geometric patterns in the animal and plant kingdom, too, including seemingly complex patterns such as spirals and the Fibonacci Sequence (which turns out to be an optimal pattern for leaves to get sunlight, and you see it (for example) in the patterns of seeds on a sunflower). Life can and often does certainly create geometric patterns. But so does non-life. The Grand Canyon is an excellent example of a fractal — an incredibly complex geometric shape. As do clouds, snowflakes, mountains, river deltas, and waterfalls. Valleys have a characteristic size given the environment, creating patterns of undulating waves. Sand dunes also have a characteristic wavelength and create undulating patterns. Individual mountains have nice, regular geometric shapes within the fractal pattern mentioned above. And so on. In my particular field of study, we can look at impact craters. These are typically circles. Or ellipses. On Mars, there’s a certain type of crater that produces ejecta that looks like petals on a flower with nice broad, sinuous, regular perimeters. We also get craters forming all in a row, either from the impact or breaking up into a string of objects or ejecta from the crater itself producing them. These can have very regular, V-shaped ridges between them formed by overlapping ejecta curtains during formation. There’s also the famous “Meteor Crater” in Arizona which is practically a square: This was made by pre-existing faults that controlled the shape as the crater was formed, and we see these elsewhere, too. In fact, I was just in Arizona for a conference and you see plenty of flat-topped mesas which sharp, angular edges that form the drop-off of a cliff, controlled by veins of material with slightly different strengths. In fact, this kind of claim is so common in many fields of pseudoscience that it has a basic logical fallacy to describe it: The Single Cause Fallacy. Item A can be caused by Thing B. Therefore, Thing B was the cause. This ignores the obvious: Many other things could be the cause of Item A, I just assumed that it was Thing B for whatever reason. As opposed to a natural process that we see not only at home on Earth, with myriad examples, but all over the solar system, as well. As opposed also to – in some cases that he and others have claimed – what really could be an intelligent cause: computer compression artifacts and/or electronic noise (think speaker static) in the camera detector. My bet for some of the stuff shown across the internet is in that last category. My bet for all the rest is in that first category, that it’s simple, basic, geologic (and other natural) processes that can easily create regular geometric patterns. While Richard is fond of quoting Carl Sagan when it helps him, he needs to remember other things that Carl also said: Extraordinary claims require extraordinary evidence. Pictures of features that could very easily be described by known, does-not-require-intelligence-to-explain-them phenomena do not qualify as that extraordinary evidence. I really don’t want to give this one much time. “Crrow777” as he is known on YouTube, or just “Crrow” in interviews, is (from what I can tell) rising somewhat in the conspiracy world for reasons that I don’t understand. Among other things, he thinks the moon (Earth’s moon) is a hologram. I have listened to some of his material, and I have heard several of the interviews he has given. I think he believes what he is saying. I don’t know beyond that what his mental state may be. For this and other reasons, not the least of which is that the claims he makes are insane, I don’t want to feed the birds beyond what I need to to quickly debunk his foray into Pluto and New Horizons. I have seen two additional Pluto videos on YouTube of his that go beyond the first one he posted. I’m only going to focus on that first one: “Crow Images vs NASA Images – Pluto is Only at Disneyland.” His videos typically get on the order of 10,000 views. This one has nearly 100,000 because it was picked up by various news outlets who did want to give him more attention. It really boils down to this: Because he can get from Earth (what he thinks) are better images of Jupiter and Jupiter’s moons than what NASA was showing of Pluto from New Horizons several days before encounter, New Horizons is fake. First off, in his first video, he is fully focused on saying that Jupiter in his camera and telescope is better than Pluto from the LORRI instrument on New Horizons. In his second video, he commits the logical fallacy of Moving the Goalpost and claims that what he really was talking about was Jupiter’s moons, not Jupiter. Let’s do some really basic math. Jupiter was near the opposite side of the sun as Earth in mid-July, meaning it was around 900,000,000 km from us. Pluto was very roughly 5,000,000,000 km from us, or around 5.5x farther. Jupiter’s radius is about 71,000 km (on average). Pluto’s radius is around 1190 km. So Jupiter is around 60x bigger in size. Take 60x bigger and 5.5x farther from Earth, Pluto is going to look around 330x smaller than Jupiter. Okay, but what about from New Horizons? The first images that he complains about and said were an “insult to your intelligence” were from late May, when New Horizons was about 50,000,000 km away from Pluto, or about 18x closer than we were to Jupiter. Except, he wasn’t showing you LORRI images. He was showing you MVIC images, which have a much worse pixel scale. It’s the second animation he shows, about 3:45 into the video, which is from LORRI from April, when New Horizons was about 110,000,000 km, or 9x closer than we are to Jupiter. So, simple math: Jupiter is 60x bigger, New Horizons was 9x closer, so Jupiter would STILL, if the optics were all the same, be about 6.5x bigger than what he’s doing in his back yard. Except, the optics are not the same. I don’t know the field of view of his specific telescope. The build of the telescope changes the field of view, as does the camera size. 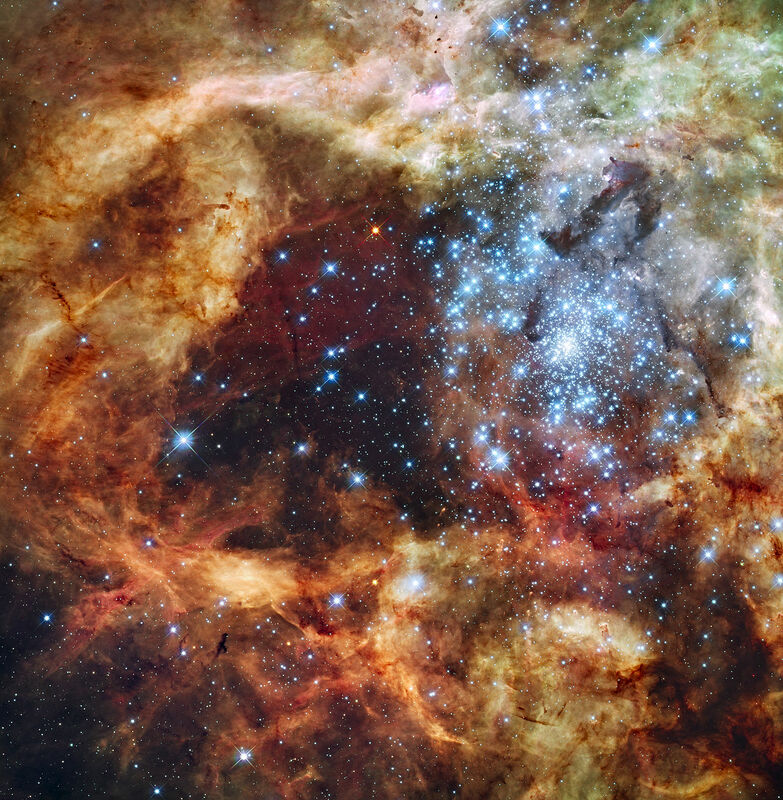 LORRI has a field of view of 0.3° (about 60% the size of Earth’s full moon). It also has a 1024×1024 pixel detector, or 1 megapixels. Crrow777 looks like he was using a dSLR camera, which typically has around 20 megapixels. That means that his resolving power – the ability to see a certain number of pixels across a feature – is going to be around 4-5x that of LORRI (take the square-root of the number of pixels, which is area, to get length). So, not only is Jupiter going to still be 6.5x bigger if the telescopes are the same, but due to the number of pixels in his camera, it will be about 30x more pixels across than how New Horizons is seeing Pluto. He also complains that he has city lights and an atmosphere to deal with. But, he’s using techniques which help get around that, which those LORRI images he was showing were not using. He also (around 4:30 in the video) just starts to rant about the images being an insult to peoples’ intelligence. I think his basic misunderstandings are an insult to peoples’ intelligence. He also complains (5 min) that these are “high resolution” from NASA but as he defines “high resolution,” meaning you can “get down and resolve detail on these things,” then under his definition – which is different from the term as NASA was using it – they aren’t. Except they are. We could resolve features on months out that we had never been able to resolve before. And days out, which are the ones he complains about at that time stamp, we were resolving surface features. It’s not “junk” (his term). All because he doesn’t understand something doesn’t mean the incredibly hard work and dedication by hundreds of people was all fake. Just because you don’t know basic math, basic optics, and basic technology doesn’t mean that everything is a conspiracy. Instead of everyone lying, maybe it’s YOU who needs to actually do a little extra work and learn something instead of acting crazy. I took a look at his second video. Nothing really new in it except probably 80% of it is ranting and raving about The Masons and that nobody should trust The Government. One of the very few new things in it was ranting that there were better than 1 Mpx cameras available at the time New Horizons was built. This ignores two things: You have to go to the initial proposal – not when the craft was built and certainly not launched – and you have to look at what is tried and true technology that is capable of surviving the much harsher environment of space (temperature extremes and radiation). You can’t just go to the local camera store, buy a camera off the shelf, and fly it to Pluto. Ranting about should’ve-been-able-to-do-that shows you know absolutely nothing about how space missions work and how the technology on those missions is selected, built, and tested. I also took a look at his third, rather short video, claiming that the colorized full-frame Pluto images was faked because if you invert the colors and increase the levels, you see a blockiness around the edge of the disk. Again: All because YOU don’t know anything about what’s going on doesn’t mean it’s a fraud. This was a lossy JPG B&W image, with MUCH lower resolution color data overlaid on it, and then saved and exported again with lossy JPG compression. If he had BOTHERED TO READ THE CAPTION, he would know this. At the time, I spent many words showing how it could be faked in computer software and why I was (a) doubtful of it being genuine from the camera, and (b) of course dubious that it “meant” anything out of the ordinary. I also showed (c) that it had been tampered with between the original that was posted online and the version that Richard posted. In the Comments to that post, it was pointed out to me that there could easily be another explanation: Rolling shutter. This is where, instead of a camera taking a single shot where each pixel is exposed at the same instant, the pixels are exposed in rows or columns and read out over a finite period of time. This can produce really weird effects, such as this famous one of an airplane propeller. It looks like, while my analysis was valid (the image was tampered with, one could easily reproduce the effect in computer software, and standard chain-of-custody questions were not answered), the culprit really was the rolling shutter effect. Sharon Hill over at Doubtful News has published an identical effect (pink vertical beam) taken with the same kind of camera, but unambiguously in the middle of a city and caused by a distant beam of lightning. Seems like case closed. I wonder if Richard Hoagland, Linda Moulton Howe, and others who promoted the 2012 picture will issue a retraction. Pretty sure I know the answer. Richard Hoagland has his own radio program now, “The Other Side of Midnight,” on Art Bell’s “Dark Matter Digital Network.” It’s a two-hour program that programmatically airs live, Monday through Friday, from 1AM until 3AM Mountain Time (hence it really airs Tuesday through Saturday in the US except Hawai’i). It is young, only in its third week, but already many patterns have emerged. Readers of this blog and listeners to my podcast will know that I have critiqued many of Richard Hoagland’s claims in the past. Heck, the tree of episodes of my podcast even has a specific section for Richard Hoagland’s claims that I’ve addressed. Last night / this morning, Richard had open lines calls. I made it through and was on for just about 13.5 minutes. Here’s why I called, why I was “Robert from Wisconsin,” and what we learned. Oh, and the reason why I’m outing myself here is that someone already e-mailed Richard and told him it was me. Why Richard — Aren’t I Beating Up on Him? That out of the way, there are, as I said, two reasons. First, Art Bell and Coast to Coast AM. And, Richard was one of the more frequent guests on said late-night paranormal program for nearly two decades. I spent a lot of time listening, and hence listening to Richard Hoagland. One is usually wont to focus on something that they hear more often than things they don’t. Second, you can hardly swing a dead mouse in planetary science fringe claims and NOT hit a topic that Richard Hoagland has dipped into. He is prolific. And, I study planetary geology and, even more specifically, images and image analysis. Richard Hoagland focuses on claimed “geologic” features on other planets and moons and asteroids and comets, and he uses image analysis (faultily, I’d argue, but uses it nonetheless). So, because of what I listen to, and because of his own prolific behavior in the fields that I focus on, Richard Hoagland rises to the top in terms of claimants that I tend to focus on. I called Richard’s radio program because I have often been encouraged to call into programs that he is on to ask him questions. This has been by fans of Richard, and/or by fans of my own material. Occasionally, it’s been in the form of “put up or shut up,” that I shouldn’t be arguing to no one, I should ask him specifically for explanations or justifications of his claims rather than just writing about them here or podcasting about them. In addition, I’ve been encouraged by many people to “debate” Richard. That’s a separate topic entirely, but as a flavor, I wanted to see what would happen if I were to call, and attempt to just discuss one or two very specific topics with him, to get an idea of how a debate might play out. More on that in the “What I Learned” section of this post. John E Brandenburg was on Richard’s program the night of August 3/4, the show immediately prior to the one I called into. I have both written on this blog about Dr. Brandenburg and his claims and presentation, and I have podcasted about his main thesis, that Mars was nuked. Back in March of this year, Dr. Brandenburg “presented” his ideas at a science conference. I documented it extensively on this blog because of issues I have of lending legitimacy to fringe ideas by “letting” them into science conferences. It’s a damned if you do, damned if you don’t scenario: If you let them present, they claim legitimacy (as Dr. Brandenburg has done extensively, for in every interview I’ve heard of his on more than 4 radio programs, he cites presentations at science conferences as lending legitimacy to his claims), or if you don’t let them in they claim censorship. However, despite my documentation of his presentation at the March conference, his recitation of those events contradicts reality. And, his statements of the conference, made just under two weeks apart, contradict themselves. To me those seem mutually exclusive (either no one contradicted him or said he was wrong, or people argued with him). And it flies in the face of what I documented a few days after the fact, where he set up and was at his “posters” for no more than 15 minutes and only spent half that time actually at his poster and talked to perhaps one dozen random stragglers. Thank you for your invitation to debate Dr. Brandenburg, live. I am going to have to decline. While I stand by what I wrote and my opinion about his ideas, doing a live debate on this topic is not something that I can do. The reason is subject matter expertise. For example, if we were to debate about the chronology of the Moon or Mars, especially from impact craters, I’d be all for it because that is my research area. If we were to debate on the “Face” or “Pyramids” on Mars, I could do that reasonably well because it is something that I have heavily researched over the years and know the topic and arguments well (though I know Richard Hoagland’s and Mike Bara’s arguments about it better than John Brandenburg’s). The same goes for Planet X, image analysis, the “true color” of Mars, and some other topics. However, I am not a spectroscopist. I’m not a nuclear engineer. When I have addressed Dr. Brandenburg’s claims, I have had to do external research for each claim. The same goes for the two e-mail exchanges I have had with him. While I am still confident in my conclusions based on that research and what I know about related subjects (e.g., his implication about the age of Lyot crater and that being one of his favored nuke sites — it doesn’t work with the chronology he needs), this method is not conducive to a live debate, and therefore I decline. If you are referring specifically to my points about how to behave at a scientific conference and Dr. Brandenburg’s presentation there, there is nothing to debate. What I stated is objective fact, and I have documentation for much of what I stated. If you would like me for a different program to discuss something I named in the second paragraph or is aligned with my research (http://about.sjrdesign.net), then I’d be happy to discuss it further. In that response, I clearly laid out that Dr. Brandenburg is not someone I’m comfortable debating live because of the subject matter expertise in that area, versus other things I could debate live. I think that’s pretty clear. RCH: “Uh, does he say why? But besides the name-calling, John completely misrepresented my response to the radio host in terms of why I declined a debate. So the reason that I used a pseudonym when calling Richard this morning was that I didn’t want him to reject my call because of who I am, nor did I want him to enter the conversation with preconceived ideas. You might disagree with that reasoning. It was also 2AM my time and I was falling asleep. But I stand by using a pseudonym for the reasons explained above. Why does Richard keep calling things a “model” as opposed to putting his £1 down and saying whether he thinks something or another is true? Why has Richard not identified (or searched, if he has) his lunar “glass towers” in any imagery other than scanned Apollo photographs or small, JPG’d Chinese photographs of the moon? #1 might seem trivial, and indeed, Richard tried to say exactly what I knew he would say but I didn’t get the chance to be specific: He said that he says “model” because it is a “model based on data” and subject to change based on more data. This is very scientific. And on its face, is the hallmark of someone following the scientific process. However, as Richard tends to implement it, it is a crutch to fall back on when he is shown to be undeniably wrong. For example, that comet Elenin was a spaceship was a “model” that Richard insisted, based on the “data” at the time, but Richard insisted that it was really true, and he used language such as “undeniable” and “proof.” He’s since generally refused to address it after Elenin broke up. Meanwhile, his latest and “greatest” stuff about archologies on Pluto are also a “model” that he insists is real based on the “data” that he has. You simply can’t have it both ways, but Richard seems to try. #2. Moving on, the second point is something Expat has written more about than I, but I addressed in a very extensive blog post a year ago, “Is Camera Noise Evidence for Ancient Advanced Civilization on the Moon?” Unfortunately, at 2:20AM, I said “JPEG artifacts” instead of “camera noise” which I’m kicking myself for now. But here was the point I was trying to get across: Inconsistency. Richard claims there are glass towers on the moon. His evidence A is Apollo photographs of the lunar sky that were in an album of Ken Johnston for decades and then he scanned at home. His evidence B is the Chinese images that I linked to in the blog post in the previous paragraph. The question I was trying to get across is that he has these two missions’ data, but that the anomalies he’s seeing could be fairly easily explained by something mundane: Dirt on the photos or scanner for Apollo, and detector noise, optical effects, and compression artifacts for the Chinese images. It’s not possible today to get literally original images of Apollo, they are stored in vaults that ain’t no one touchin’. The Chinese space program – like most government things in China, is very closed, and the at least claimed original, raw images from the spacecraft are not available in any public archive I’ve found. So my attempted question was simple: Has he seen these features in ANY of the OTHER space missions’ digital images that you can get in at least what is claimed as original, raw format? E.g., any from Clementine, Lunar Prospector, Lunar Reconnaissance Orbiter, Kaguya, Chandrayaan-1, etc.? Once I finally was able to sort of get the question out in mangled form (more on that in the next section of this post), Richard’s response was, how do we know that those official raw images are really real and unaltered? You can just have a computer do a levels clip to remove the glass towers. How do you know if those features are real? If they are on an official image, does the image show those features? If not, then the image has been faked. If the image shows those features, then the image is real. Therefore, since the image is real, the features are real. Or something very close to that. In other words, you can’t use the premise that the only real, unaltered images are ones that show your features of interest as the criteria for whether your features of interest are real. It’s also highly suspicious that the only images that Richard says he sees his features in are ones that really are more simply explained by some other process, rather than those images that scientists would actually use from other spacecraft. Or, perhaps it’s the assumed major premise fallacy. Regardless, hopefully you have gotten my point, and it’s what I was trying to get across in my call. From listening to over two decades of Richard’s interviews, I knew the basics of what to expect, that Richard would (1) allow me very little time to speak, and (2) tend to go on unrelated tangents. I thought I was prepared. If you listen to the audio, I encourage you to time how long I spoke versus Richard. I also encourage you to count how many times I attempted to ask my second question, and how many times Richard went on a tangent. So one thing I learned is that I canNOT – even if offered – debate Richard on his own program without a fair moderator. Even when Richard is hosting a normal show with a single guest, Richard spends at least an equal time talking as the guest, if not more. That’s untenable in a debate, to be both a debater and the host. Let’s put it this way: He’s so passionate about his claims that he has demonstrated an inability to self-moderate and keep himself on-topic and to a time limit. Another thing I learned was that if Richard wants to tell a story, he will tell it, regardless of what you’re trying to ask. Seriously, listen to the audio. Then see the above paragraph. I don’t think I’m being unfair in this statement. This makes the third thing I learned, that it is very, VERY difficult to ask a question that’s longer than one sentence. Because I kept trying to set up my second question by giving the preamble that people have found holes with his Apollo and Chinese images (background) that he should look to images that are unambiguous with his critics (question/statement), he kept jumping on to try to explain tangents related to the background statement that really didn’t have anything to do with my question. This is yet more reason why any debate would need to be very, very structured. Not only with an independent moderator, but also with topics prepared ahead of time such that the moderator would keep the debaters to them. Even when I made the side-comment about much of the Apollo photographs referenced by conspiracists being film positives rather than negatives, Richard went on a roughly 2-minute tangent (guessing here, I haven’t re-listened to time it). Those tangents add up and really don’t add anything to the conversation. Another thing I learned is that Richard will use semantics to explain something or make a point, regardless of its validity. For example, “model.” For another example, when I was trying to ask my second question for the Nth time, Richard said that his critics are “idiots” who think that his glass structures on the moon that he sees in Apollo images could be dirt on the photos or scanner. I said that they have an “explanation” for it, and Richard said they didn’t. I said that’s semantics — they do have an actual explanation, he just may disagree with it, and it may be valid or invalid, but they do have an explanation. Richard again said that was wrong, and that he wasn’t playing semantics. He was. According to my dictionary, “explanation” is “a reason or justification given for an action or belief.” It says nothing about that being a valid action or belief. That’s a lot of text, over 3300 words. And I may add a bit as the day progresses and I think of more things. I’m not going to go through the call and dissect it bit-by-bit, there’s no real reason for that. But, there you have it, why I called in (encouraged to do-so), why I used a pseudonym (he called me a troll and I didn’t want that to bias the call), and some of what I learned. Oh, and add to Lessons Learned: I need to use my good microphone, and I need to have a drink of water next to me. My voice was higher than normal during the call.